There were some pretty amusing cards. I liked the tickle fight one myself. 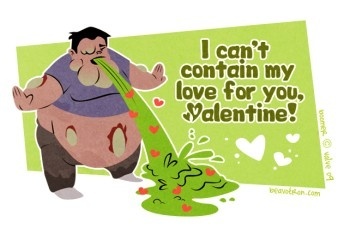 Screw flowers, i want vomit! Erm, sorry. Still, I'm gonna have to pelt these at people. Hehe this was my favorite as well! Anything is awesome if it has the Pyro on it. I don't know why, but he looks adorable. Personally, I too liked the Tickle Fight. Good point. We cannot rule out the possibility that the suit is full of hamsters. I like the survivors one. It almost rhymes. Haha the tickle fight one is great. And on another note, who cares what gender the pyro is, we will never know so we might as well just drop it and call the damn thing it. I saw this a while ago. I can't help but be biased and say it's the greatest thing on the internet ATM. I love 'em, hilarious. And Ms. Neonakis' artistic talent is a joy to behold.